His species is now endangered and rarely seen by human eyes. 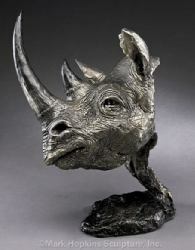 Yet, drawing upon his brutish strength, the Black Rhino continues to make his way in the world. With a massive frame and intimidating power, he is a living tank. To catch a glimpse of this amazing creature is an incredible experience.